OTTAWA - The Ottawa Redblacks are playoff bound — in just their second season of existence. Chris Milo kicked four field goals and Henry Burris threw for 370 yards and a touchdown as Ottawa defeated the Winnipeg Blue Bombers 27-24 on Friday to clinch a playoff berth for the first time in its young history. "It's a great feeling and it just shows that the hard work that we have put in is paying off," said Burris. "Bringing in the new acquisitions through free agency and bringing the new coaching staff and the growth we've gone through, we have to continue to make sure we get better going into these last three games and into the playoffs." The Redblacks are the third incarnation of Ottawa football in the CFL. The old Rough Riders qualified for the post-season in 1994, despite finishing the regular season with a 4-14 record, and folded in 1996. The Renegades played four seasons in the league starting in 2002 and never made the playoffs before the franchise was suspended in 2006. Neither team was able to produce any offence in the fourth quarter until late when the Redblacks increased their 19-9 lead with a four-yard touchdown run from Will Powell — his second major of the game. An 82-yard single on the ensuing kickoff gave Ottawa a 27-6 lead. Matt Nichols threw a three-yard touchdown to Nick Moore in the final two minutes and then a five-yard pass to Clarence Denmark with 10 seconds to play. Ottawa (9-6) won the coin toss and elected to receive the opening kickoff of the game, which was quickly fumbled by Reggie Dunn and recovered by the Blue Bombers (5-11) deep in Redblacks' territory. Luckily for the Redblacks, Winnipeg was unable to generate a first down and was unsuccessful on a third and one, turning the ball over on downs. "That's a momentum play immediately and you need to capitalize on that. That's what good teams do and we didn't do it," said Nichols. "We need to find a way to get it done. I don't know what it is but we need to find out how to fix it and make plays when opportunities come. That kind of momentum switch so early can really set the tone for the rest of the game." 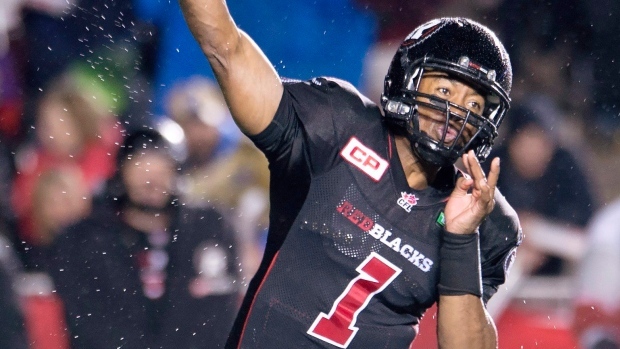 The Redblacks were able to hang on to the ball on the ensuing series and travelled 95 yards on 14 plays, the last being a five-yard touchdown pass from Burris to Powell. Milo converted that and then added a 27-yard field goal five minutes into the game for a 10-0 lead after the first quarter. The Redblacks were able to move the ball with confidence in the second quarter, getting into the red zone a couple of times, but only coming away with a pair of Milo field goals in the final two minutes — one from 13 yards and the other 37. The Redblacks had a 16-0 lead at the half, led 19-3 in first downs and had possession of the ball for nearly 22 of the opening 30 minutes. Those numbers shifted in Winnipeg's favour to start the second half as the Bombers took the opening drive 67 yards in just over four minutes, made six first downs and ended the drive with a five-yard touchdown pass from Matt Nichols to Darvin Adams. The score was converted by Sergio Castillo as the Bombers cut the lead to 16-7. "There are a whole bunch of things that we have to correct and keep moving forward," Redblacks coach Rick Campbell said. "We want to win as many games as we can, but the next thing is to try and clinch a home playoff spot and then try to clinch first place overall. We're going to try and keep climbing the mountain." The Redblacks continued their trend of moving the ball, eating the clock but only coming away with three points, as they did with a 22-yard-field goal from Milo at 11:14 of the third quarter for a 19-7 lead. Ottawa intercepted Nichols late in the quarter but the Redblacks gave up a safety when Burris was tackled in the end zone.